Kim is a highly respected, qualified & experienced pop vocal coach with a successful career in a field where she is regarded as an industry leader. She is an independent, evidence-based, medically-aware vocal coach who is fluent in the terminology and concepts of the major vocal methodologies. 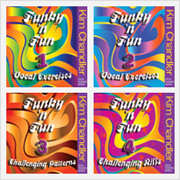 However, she favours the use of her own product, the "Funky ‘n Fun" vocal exercise series", as the basis of her approach to teaching singing technique and relevant musicianship. In her private lessons, Kim has moved on from the role of a ‘singing teacher’ because the advanced level of client she teaches can already sing. She is more akin to a sport’s coach for elite singers, working to establish optimal vocal efficiency, all the while making sure that each person retains their unique sound & style. Lessons are generally an hour long and are a customised, individualised mixture of specific & effective vocal techniques, innovative & musically-relevant exercises and troubleshooting work on repertoire chosen by the client. Kim also offers invaluable career advice and industry tips where appropriate. Kim’s large, bespoke teaching studio is in Marbella (Southern Spain), very accessible from most European cities by flying to Malaga. She also holds a limited amount of private lessons in West London on a sporadic basis. However, most of Kim’s clients around the world benefit from the convenience of having their coaching with Kim online via Skype or FaceTime. She has offered online lessons since 2010 so is very experienced in this format. Kim only teaches adult singers (i.e. 18 years +) who are already at an advanced level and serious about their singing careers. As a CCM (‘Contemporary Commercial Music’) specialist, Kim doesn’t teach Classical or Musical Theatre repertoire. Kim’s select clientele is comprised of professional singers, established artists, artists in development and other vocal coaches. Her teaching rate reflects the market rate for this type of client base. Each new client is required to undergo a pre-paid, hour-long initial assessment to determine suitability. You are ultimately responsible for your own vocal development, vocal health and career path – Kim is an information source and guide/mentor only. In order to remediate certain aspects of body usage whilst singing, Kim’s teaching approach is necessarily ‘hands on’ at times. Although always conducted with the utmost professionalism, you would need to be comfortable with this approach. In order to rectify vocal issues as soon as possible, Kim will work with you as fast as you can comfortably go and teach you to teach yourself in order to make you an independent learner. Kim’s other work (i.e. session work) may take precedence over booked private lessons at times. However, should this occur, she will always inform you and reschedule the lesson as soon as possible. Due to the unpredictable nature of her session work Kim is unable to guarantee regular weekly slots on the same day and time for any of her clients. Lessons are booked on a week-by-week basis. Only consider coming to Kim if you are prepared to be flexible. Due to high demand on lesson slots, you must give the industry-standard minimum of 24 hour’s notice of cancellation of a lesson. Less than this amount of notice, in addition to forgetting or missing a scheduled lesson or being late (regardless of the reason), will result in the full cost of the lesson being charged. If the lessons is in person, you must not come to a lesson ill or with anything contagious, e.g. conjunctivitis, colds in the early stages of excessive sneezing, coughing etc. If this transpires, the scheduled lesson can still take place online rather than be missed. If you wish to obtain more details about booking an initial assessment, please contact Kim. If you would like to benefit from Kim’s invaluable feedback on your or someone else’s vocal performance, then take the opportunity to send Kim links to audio files or video clips. She will then provide detailed, personalised written feedback on technique, musicality, interpretation & visual performance (where appropriate) and give specific advice on how to improve. Vocal consultancy fees apply for these services. For more information contact Kim. Based on the conditions above, if you feel that Kim isn’t the right teacher for you then she recommends that you contact the British Voice Association to find other reputable teachers. In order to choose a singing teacher wisely, it is strongly suggested that you read Kim’s invaluable free advice concerning Choosing the Right Vocal Teacher before you start your search – it may save your voice and your valuable time and money!